Designed by Cathy and worked on pure linen twill, this Crewelwork pomegranate is worked with Appleton 2-ply wools in three colours. The embroidery has been made up into a 'pillow' with rust velvet trim and velvet back, and decorative tassels. It is filled with pomegranate pot pourri. The finished pillow measures 17 x 20 cm. Suitable for complete beginners who wish to learn a range of stitches. Also suitable for enthusiasts! All materials and equipment will be provided, but you may wish to bring your own 6" embroidery hoop if you have one. A seat frame is best, but not essential. Alternatively, you may borrow a standard hoop for the day. Standard and seat frames are normally also available to purchase). £45 per person including all materials to make up the pillow. The pot pourri is NOT included. The design will be pre-traced onto your linen twill. 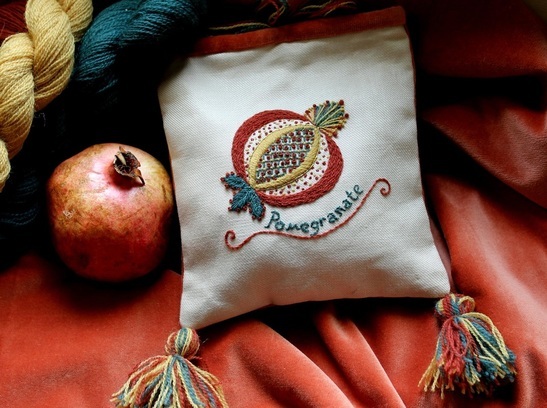 You will work the the various stitches that make up the pomegranate, including stem stitch, satin stitch, fly stitch, and Jacobean couching. It is not possible to complete the stitching for this project in one day, however you will learn all the stitches and will be given full guidance and instructions as to how to complete the project at home. The embroidery is worked on a piece of linen twill measuring 21 x 21 cm.